That the brain is evolution at its finest is perhaps best demonstrated by the beauty, complexity and diversity of dendrites – tree-like structures that form neural circuits by connecting a neuron to its synaptic inputs. Recently, neuroscientists studying the tree-like branching of these diverse structures … have derived a surprisingly simple and general equation that directly relates dendrite length with the number of branch points, dendrite spanning volume, and number of synapses. RICHMOND, BC – Catalyst Paper Corporation received approval today for its reorganization plan from the Supreme Court of British Columbia. The company’s second amended plan under the Companies’ Creditors Arrangement Act (the Amended Plan) received 99 per cent support from creditors at meetings held earlier this week. Court approval of the reorganization plan comes only five months following Catalyst Paper’s entry into creditor protection on January 31, 2012. VANCOUVER, BRITISH COLUMBIA – Western Forest Products Inc. announces that it has closed the previously announced sale of Tree Farm Licence 60 and related assets on Haida Gwaii to Taan Forest Limited Partnership , a partnership of the Council of the Haida Nation and Haida Enterprise Corporation, the business arm of the Haida Nation. Under the terms of the sale, Western will receive net proceeds of approximately $12.2 million, of which $2.6 million has previously been received. PICTOU LANDING, N.S. – A First Nation in Nova Scotia is moving forward with a lawsuit against the provincial government and Northern Pulp Nova Scotia Corp. The Pictou Landing First Nation launched the lawsuit in 2010 demanding the province clean up nearby Boat Harbour and build a new treatment plant for effluent from a pulp mill now run by Northern Pulp. BRIDGEWATER — The Canadian Parks and Wildlife Society wants the provincial government to buy all the Bowater Mersey land that’s for sale in Nova Scotia. That amounts to 220,000 hectares, which is four times the size of Kejimkujik National Park, said Chris Miller, national conservation biologist with the society. The woodland is in six counties — Shelburne, Queens, Lunenburg, Annapolis, Hants and Halifax — and is some of the most productive forest in the region, as well as an important habitat for species at risk, Miller said. The United States is known for its liberal application of antidumping and countervailing duties to protect domestic companies. …there is a thin line between rulings that have merit and those that have been influenced by potent lobbying efforts and pressure from Capitol Hill. As a newly elected congressman in the mid-1970s, I was approached by wood mill workers seeking my support for a petition that called for limiting the importation of Canadian wood products that were threatening their businesses. …eventually our government imposed a tariff to offset a Canadian province’s subsidy that took the form of providing harvestable trees at no cost to its private lumber companies. …This month, the US government slapped preliminary tariffs on Chinese imports. That may protect domestic producers of renewable energy products, but more likely it will harm America’s urgent need to become energy independent. HERKIMER COUNTY, N.Y. — A major overnight fire damaged a lumber mill in Herkimer County. Dispatchers say firefighters were called to Little Falls Lumber on Southern Avenue in Little Falls at about 11 p.m. Thursday. Firefighters have been on scene putting out hot spots throughout the morning. There’s no word yet on how extensive the damage is. YNN has a crew heading to the scene, and we will bring you any new information as soon as it comes in. RPG Logistics has opened a new forest terminal adjacent to Port of Gothenburg. The new logistic terminal specializes in forest industry. It will receive paper, pulp, timber and other forestry products transported by rail and road from paper- and sawmills throughout Sweden. The reality of second-growth cedar trees makes today’s shingles substantially less durable than roofs shingled with old-growth wood that built the original reputation for durability in the first place. I’ve seen too many cedar roofs fail to endure as long as even economy asphalt shingles. There is an extremely durable engineered alternative to cedar roofs that lasts much longer, costs no more and looks virtually indistinguishable from wood. It also happens to be 100 per cent Canadian. …Enviroshake uses abundant feedstocks of long-lasting synthetic and organic materials to create shakes that look virtually indistinguishable from wood when viewed from the ground. How much wood would a woodchuck recycle in the Northwest? With all the trees here in our woodsy region, you would think wood recycling would have a higher profile. As an organic material, wood is eminently recyclable or compostable, but wood recycling does not show up on the radar screen for many consumers. Jackie Heinricher understands bamboo. First she figured out a way to reproduce a species that doesn’t take over your garden or yard. And now she’s found a way to make it a fast growing, reliable way to make pulp for paper. “What we hope to see is bamboo utilized for forestry and for it to ease pressure off naturalized forests,” she said. …Bamboo will never replace northwest timber, but Heinricher says it could take pressure off forests used to make paper pulp. Paper giant Kimberly Clark has signed on to see if it will work. Ontario’s endangered wildlife dodged a bullet (and a bulldozer) recently, when the provincial government reversed its decision to gut the province’s world-class Endangered Species Act with a raft of amendments stuffed into a controversial omnibus budget bill. Legal experts, former politicians, and environmentalists, including me, had expressed concern about Bill 55’s damaging revisions to several environmental laws in the province, most notably the Endangered Species Act. OTTAWA, ONTARIO — Forest sector officials from Canada and the U.S. gathered over the past two days in Washington, at the first-ever summit on forest health, to advance scientific co-operation on shared challenges. Officials identified research areas in which collaboration and knowledge exchange could enable both countries to better protect the health and sustainability of the two nations’ forests. “This summit is an important first step toward the creation of a Canada-U.S. forest science agenda,” said the Honourable Joe Oliver, Minister of Natural Resources Canada. VICTORIA – Guide outfitters will benefit from greater business certainty starting July 1, when amendments to the Wildlife Act come into force more than doubling the maximum term of a guiding territory certificate. Guiding territory certificates allow guide outfitters to exclusively ply their trade and hire themselves out to non-resident hunters in a defined area. The duration of these certificates will now increase from a maximum of 10 to a maximum of 25 years, giving guides increased business certainty. Jim Irving says he’s very disturbed if people think J.D. Irving Ltd., the province’s largest forestry company, is not co-operating with the provincial government. The company continued to remove pulpwood from Crown land after the Natural Resources Minister Bruce Northrup issued an order not to do so two weeks ago Irving, the company’s co-chief executive officer, said as soon as he heard about order, he contacted Northrup to explain how the move would lead to layoffs. …Northrup said in an interview this week he changed his mind about the ban out of concern for jobs. Two forestry companies have reached agreement with environment groups, northern towns and a first nations community on a plan to protect a critical caribou habitat in northeastern Ontario, in the first of what the industry pledges will be a series of such deals across the country….Under the deal, some 835,000 hectares in the Abitibi River forest – an area roughly the size of Yellowstone Park in the U.S. – will be excluded from timber harvesting in order to protect the threatened woodland caribou, considered a bellwether species whose fate reflects the health of the ecosystem. Job cuts and office closures are coming to Ontario’s Ministry of Natural Resources as it chops $70 million or 10 per cent of its spending over three years, Minister Michael Gravelle confirmed Thursday. “These are tough decisions,” he acknowledged at a news conference, overshadowing the release of a plan to protect woodland caribou in a huge chunk of wilderness between Timmins and James Bay. DC Loggers Genier Bros. Trucking Ltd. announced their television show: DC Loggers and has commenced production. DC Loggers is the first production of the new and exciting film industry developing in Cochrane, Ontario. Through the DC Film Office, Cochrane is diversifying its economy, revealing how “Wonderfully Unexpected” Cochrane is….The premise of the series is the Genier Brothers diversification into new wood products and showcasing their expertise in cold weather forestry research, while celebrating the greatest way of life in the best backyard on the planet. WASHINGTON – The U.S. Forest Service, Department of the Interior, the Department of Defense and FEMA today announced more air support and additional Fire Management Grants to bolster the federal effort to protect life and public safety in response to fires in Western states. Twenty-one airtankers continue to cycle in and out of firefighting action today across the western states, and more than 8,800 personnel, more than 550 fire engines and 170 helicopters are operating on wildfires around the U.S. Approximately half of active federal wildfire-fighting resources are currently staged in Colorado. Was A Small Idaho Sawmill A Smart Way To Spend Stimulus Dollars? It’s a rare thing for a small sawmill to try to get up and running while a crucial market driver for lumber — housing construction — remains in a national slump. So when the Emerald Forest Products mill reopened in Emmett, Idaho this month, something unusual was happening. “That’s a news story,” timber industry expert Todd Morgan said of the new mill. “That’s like, ‘man bites dog’ instead of ‘dog bites man.’ It’s very counter to the trend to have a new mill opening during these market conditions.” …Soon after that, Vinson and his partners filed for bankruptcy protection. In light of the market realities and the shaky path Emerald Forest Products has charted so far, it’s worth asking: Was a small-town sawmill a good bet for taxpayer dollars? A wildfire that forced the evacuation of 35,000 people from the edge of Colorado’s second-largest city has killed at least one person and incinerated 346 homes, making it the most destructive blaze in state history, officials said on Thursday. Lighter winds helped firefighters gain new ground against the inferno, which had roared unchecked on Tuesday night through communities in the northwestern corner of Colorado Springs and threatened the U.S. Air Force Academy campus in town. FAIRVIEW, UTAH — At least five wildfires burned across Utah on Wednesday, taxing resources as firefighters worked feverishly to gain control, with one in the central part of the state continuing to burn with little containment after destroying at least 56 structures, authorities said. …The Wood Hollow Fire in Sanpete County had grown to about 46,000 acres, or 72 square miles, by Wednesday evening. …The blaze is the largest of several burning in Utah. LITTLE ROCK, Ark. — A blaze that grew into a forest fire in Lonoke County has been contained. Arkansas Forestry Commission crews helped battle the blaze near State Highway 38 Thursday afternoon. Sheriff’s deputies told KTHV the forestry crews had cleared the scene by Thursday night. There were no immediate reports of injuries. Areas zoned for conservation suffered deforestation rates similar to logging concessions in Sumatra between 1990 and 2000, but maintained forest cover more effectively than lands allocated for agricultural conversion, reports a study published in Conservation Letters. The study, led by Davd Gaveau of CIFOR, is based on assessment of satellite imagery and land use regulations across 440,000 square kilometers in Sumatra. BluForest Inc. today announced that it has acquired 30,000 hectares of native forest in the province of Esmaraldas in Ecuador. The lands, appraised at an overall value of approximately US $180 Million Dollars, will bring BluForest’s total land holdings to 135,000 hectares of forested lands from which it will generate tradable carbon credits by preserving the Amazon’s rainforests. The carbon credits will be generated through the United Nations collaborative initiative of Reducing Emissions from Deforestation and forest Degradation (REDD+) in developing countries. 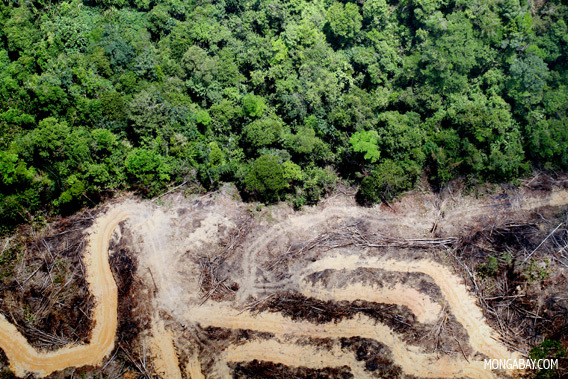 Greenpeace has launched a consultation document on REDD safeguards. Called “Forests & People First”, the initiative proposes a set of minimum safeguard standards for REDD and other forest and climate programmes. Greenpeace’s consultation document starts with an overview of why safeguards are important to REDD and to any forest related activities. The document includes a very useful matrix comparing the various multilateral safeguard policies on REDD. Despite the economic downturn and uncertainty within the euro area, the UK timber industry has remained surprisingly upbeat into 2012. Although the UK is still consuming more wood than it is processing (nearly 80 per cent has to be imported) and the total sawn softwood demand has fallen from 10 million tonnes a year to about seven million, the strong euro and Swedish krona have aided the domestic sawlog market, in that the UK sawn timber for the construction market is enjoying a £20 per cubic metre competitive price advantage over imported suppliers. An environmental group in Tasmania has warned it could call off a truce which is holding fragile forest peace talks together if a logging ban that expires on June 30 isn’t widened. The state and federal governments agreed in January for logging to be halted in most of 430,000 hectares earmarked for protection while green groups and industry representatives hammered out a deal to end 30 years of conflict. The deadline for the negotiators was extended until July 23 but the logging ban is due to expire on Saturday. Tasmania’s Greens leader has rejected allegations that he misled Tasmanians over how the Government will spend a multi-million dollar budget allocation for Forestry Tasmania. It has been revealed a $35 million budget allocation for the state-owned business is to plug the company’s predicted deficit and stop it from becoming insolvent. Western Tiers MLC Greg Hall says the Greens have been exposed for peddling false information. Shimla – Unusually hot and dry conditions this summer have turned the green hills of Himachal Pradesh into a tinderbox – literally. Forest wealth estimated at well over Rs.2 crore (over $400,000) spread over 20,000 hectares has been destroyed in forest fires in just two months this year. A forest department official said the prolonged dry spell, particularly in the mid and low hills, has led to widespread forest fires. Now, the delay in the arrival of monsoon has further aggravated the situation.”More than 20,000 hectares of forest has been destroyed in the wild fires till date. This time the damage to forests is more than 10 times compared to last year’s loss of 1,758 hectares,” Avtar Singh, Chief Conservator (Forest Protection and Fire Control), told IANS. B.C.’s carbon tax has worked to cut down the fossil fuels use of British Columbians to the lowest in Canada with little economic damage to show for it, according to a new report. The study, entitled British Columbia’s Carbon Tax Shift, weighed the B.C. carbon tax’s impact on provincial fuel use against the performance of the provincial economy. And the results give the first clear evidence that the tax has helped reduce emissions while producing tangible economic benefits, said economist and Sustainable Prosperity senior director Alex Wood. British Columbia’s carbon tax is broadly supported by businesspeople, academics, local governments and environmentalists, indicates a new Pembina Institute report. “With the province undertaking a carbon tax review, and seemingly stalled on the next steps in its climate change plan, these findings will hopefully reinvigorate their efforts,” the non-partisan group’s climate change program director, Matt Horne, said in a press release. The Pembina report, released Monday, summarized 39 confidential interviews with provincial insiders representing a broad range of perspectives and experiences. Government policies across the world generally favour locking-up forests for carbon sequestration. But a new study by the NSW Government’s Department of Primary Industries suggests: Total greenhouse gas emissions abatement and carbon storage from a multiple use production forest exceed the carbon storage benefit of a conservation forest. The report stresses that to quantify the climate change impacts of forestry, the entire forestry system should be considered: the carbon dynamics of the forest, the life cycle of forest products; the substitution benefit of biomass and wood products, the risk of leakage resulting from deforestation and forest degradation in other countries.